Hollywood juniper gets its common name from its popular use in California landscapes. 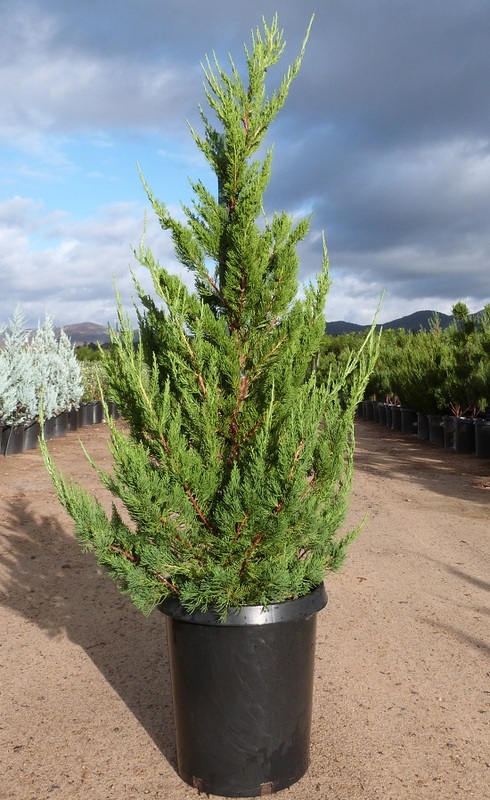 This unique juniper variety makes a statement in any landscape in many climates. Plants can be used as a green fence, privacy screen, accent specimen or even a container plant. Evergreen, deep green foliage provides beautiful for year-round interest. ‘Torulosa’ has an interesting form, somewhat spreading with a twisted habit that becomes more exaggerated with age. This unique evergreen will reach 10-14’ tall and about 4-6’ wide at maturity. Its size makes it perfect for smaller urban landscapes. The small scale like leaves make this shrub friendly to touch, instead of prickly, like other junipers can be. Small cones are produced on mature specimens, but are rather inconspicuous. Hollywood juniper is also noted for its cold, drought, and heat tolerance — making it even more versatile. This shrub has good salinity tolerance, but do make sure the soil has good texture and drainage. Hollywood juniper is rarely bothered by pest or disease, but can be prone to issues if kept too moist. Plant in a full sun location for best performance.